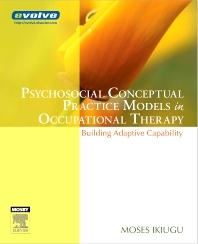 This book examines the occupational therapy paradigm (its focal viewpoint, core constructs, and values) as well as the role of complexity/chaos theory as a scientific framework for occupational therapy research and practice. Unlike other current OT texts, this book uses clinical case examples to illustrate application of proposed changes to make procedures consistent with the latest Occupational Therapy Practice Framework. The reader walks away with a clear grasp of the theoretical principles guiding his or her treatment interventions, the explanations behind those principles, and the applicable intervention for said techniques and procedures. An emphasis on clinical-reasoning skills, including information on different types of reasoning skills as well as the MAPP model of teaching helps the student and clinician translate theoretical principles into practice. The section on specific interventions addresses each of the conceptual practice models according to a consistent chapter template, which enables the reader to apply conceptual practice models in real-world contexts.